A little more than two months from now, the boxing world was going to crown itself a new superstar in Las Vegas when Timothy Bradley and Amir Khan put their Junior Welterweight belts on the line. We appeared to have two willing fighters, a July 23 date, and a build-up for an event that was no doubt a "can't miss" fight. All we needed were two signatures. It really seemed too good to be true. Unfortunately, like most things in this sport, it really was. It's a shame to see a talent like Bradley on the shelf, especially when his popularity stemmed from beating some of the best fighters in boxing's deepest division. Wins over top opponents like Junior Witter, Kendall Holt, Lamont Peterson and Devon Alexander gave him the universal recognition of being the best fighter at 140, but one critical component Bradley was missing was a big time fighter on his resume. While Khan isn't the second coming of Ricky Hatton, he is one of the more recognizable and popular fighters in the sport right now and a fight between these two would no doubt in my mind generate a superstar. Unfortunately, Bradley wasn't taking too kindly to the fact that he was playing second fiddle to Khan. For the fight, Bradley's share of the purse was $1.4 million, which is a paltry (for a millionaire) $200,000 more than he made against Alexander last January in a hellaciously bad fight. Though Bradley clearly wants more money, his deal with HBO guaranteed him a second fight in the summer for about that sum of money. If he thinks he can make more money with Khan, then maybe he should have fought someone else. Another issue that ultimately prevented this fight from happening is the fact that Bradley has no intentions of Gary Shaw promoting him in the future, hoping that free agency, at the end of June, will parlay into bigger fights that he believes Shaw can't come up with. This scenario shouldn't be new to Shaw, as Nonito Donaire did the same thing after knocking out Vic Darchinyan when he jumped ship to Top Rank. 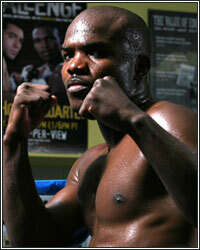 Like the Donaire situation, Bradley may find that the grass is not greener, facing a reality he may have lost a grip on. That reality is the fact that Bradley is not a draw and unless he gains more popularity, he will likely have to play second fiddle to any top fighter he comes across. Khan may not be the most liked fighter in the sport, but there are more people that dislike Khan than there are that know Bradley. That should give you an indication on how known Bradley really is. If Bradley were to fight Zab Judah or Erik Morales, there would be no doubt Bradley's purse would be much smaller than he hoped for. He just doesn't have "it." "It" is exactly what a victory over Khan would have given him, regardless of the purse or promoter. After his awful fight with Alexander, Bradley said he wanted the Mayweather's and Pacquiao's of boxing. A win over Khan would definitely strengthen his case for a fight with either, but boxing has always been about the dollars more so than the glory, and that's what Bradley seems to be after. Honestly, I still think we are going to see Bradley-Khan by year's end because Golden Boy Promotions is going to swoop up Bradley to pump life into their stable, assuming, of course, that Top Rank doesn't get him first. At least with Golden Boy, the doors would open for Bradley to face Victor Ortiz or Marcos Maidana down the road, which are suitable substitutions for a Khan bout. In the end, I hope that Bradley has really considered his options, because barring some miracle that people can't get enough of Bradley, he may be in for a rude awakening once he does decide to lace up the gloves again.